Dana is on her Mom's amazing horse Lilly, an Akhal-Teke / Mustang cross. 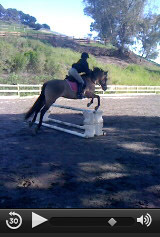 Lilly is proving to be a very smart and capable horse, and has acually jumped in competition now! Dana is proving to be quite a horsewoman - she has been the one training Lilly to jump. As a parent, there is little in life that's better than seeing your kids succeeding at something they are passionate about, and this certainly counts for me!